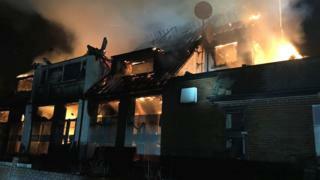 A golf course's derelict clubhouse has been severely damaged in a fire overnight. About 40 firefighters tackled the blaze after the 20:41 BST callout to the former North Worcestershire Golf Club in Birmingham. Crews worked on different sections of the building to tackle severe flames, West Midlands Fire Service said. Fifteen firefighters remained at the site on Hanging Lane, Northfield, on Monday to check for hotspots. The cause of the fire is set to be investigated.